I am never one to vow in vain. So this past Christmas vacation, as I had returned to my homeland, I gathered my brothers to the kitchen to have our second go at root beer brewing. Since the last time was rather less than tasty, I had been pondering deeply on how to make it better. Since it was too watery the first time I started with a full cup less water. It wasn’t creamy as well so I added a tablespoon of vanilla extract to the water. Since there was a distinct lack of spices I added 1/4 teaspoon of cinnamon and 1/4 teaspoon nutmeg. I added the spices and vanilla extract to the water and boiled it for a few minutes. I let it cool until it was warm and then we followed the root beer recipe as given in the instructions. The only other change we made was to add a full extra cup of honey. Not just any honey though. We added Hartman Honey. A raw honey sold in 10 pound tubs by a local bee keeper who retired a few years ago. And I must say it is the most epic honey I’ve ever had in my life. But since he has retired, you can’t buy it any more so we were using some of the last in the world. You’ve got to use it for something though. Since my parents were watching the Voyage of the Dawn Treader in the adjacent room, our pageantry was much reduced since our attentions were torn (the Twinners hadn’t seen that movie yet) but it was still a great time. After we bottled it we let it carbonate for two days as before. We enjoyed our creation on my Dad’s birthday with a fine meal of barbecued short ribs, chicken, and all of the fixin’s. I had a second bottle the next day for the official taste test. The first thing that was noticed was a significant improvement in the Head as seen from the picture below. That picture was also taken about a minute after it was poured so you can get an idea of just how amazing the Head had become. It was very frothy and lingered for a very long time. I suspect it was the honey, which increased the viscosity so the froth lingered more. The extra sugar also increased the carbonation by giving the yeast more to eat. The Body was also much better. It had a medium Body to it though it wasn’t watery. It was also creamy. The honey flavor was a tad too strong and it also gave a hint of fruity to the brew. The Bite was decent from both spices and carbonation, but the spice flavors were a little too strong as well. The Aftertaste was a spicy honey and vanilla flavor. So this was quite an improvement over last time but it was still a little off. The first time it was lacking and this time was a bit too much of the good stuff. Definitely a step in the right direction in a Newton’s Method sort of way. I must say that I actually enjoyed it with the meal and would recommend it over the original recipe any day. I give it 3 1/2 kegs with it barely squeaking in that last half a keg. 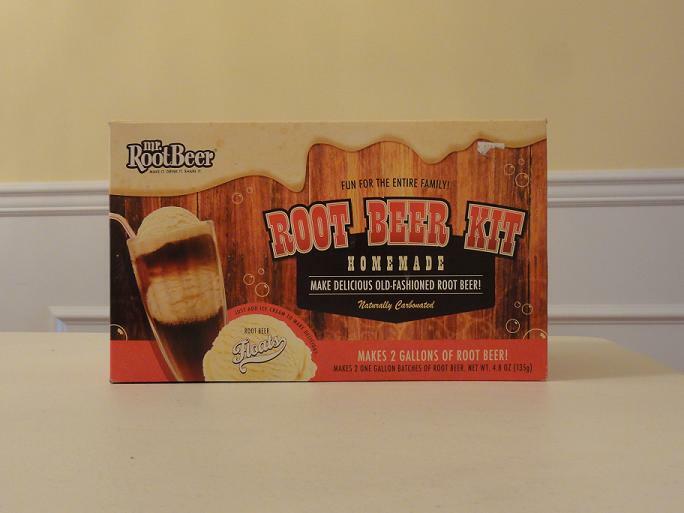 Though now that we are out of the Mr. Root Beer kit ingredients, I think that we will start brewing using McCormick extract so look for some more fun recipes in the future. 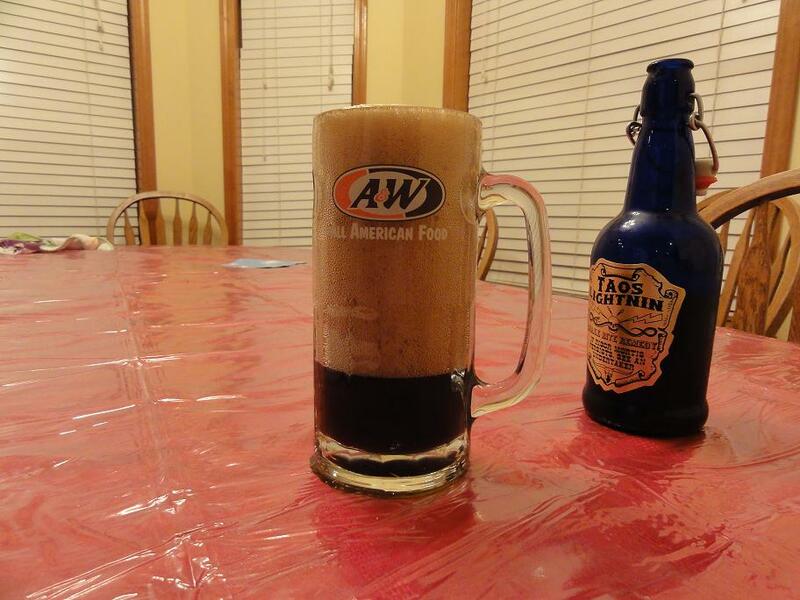 The epic Head on our root beer. This was taken a full minute after being poured. Just tried this yesterday, I wish I had read your review before starting. Hopefully it comes out ok.
At least Mr. Root Beer comes with enough stuff for two batches. You can try my recipe on the second batch.